I am the kind of girl that lusts after pretty things for a long time before I decided to make a purchase. Prove: I had been looking at Kate Spade and Michael Kors handbags for several years before I chose to treat myself to the Little Minka and Sutton models. Do not let the name “Little Minka” fool you. That Kate Spade is humongous! Because I was studying at uni at the time, I wanted my handbags to be big enough to fit my entire class survival kit. Food, food, water and more food! Oh and college books, of course. Now that I have a desk that I can use as a mini-pantry I no longer need to haul much more with me other than my keys, a small wallet and my phone. The perfect excuse to buy a new handbag! The first bag I thought of was the Rebecca Minkoff Mini M.A.C.. It’s cute, it’s small and I have wanted a Rebecca Minkoff bag for years. Sadly, they are hard to find in shops in Europe, if you can find offline them at all. I’m not really comfortable with ordering one online as I’ve never seen or felt one in real life. 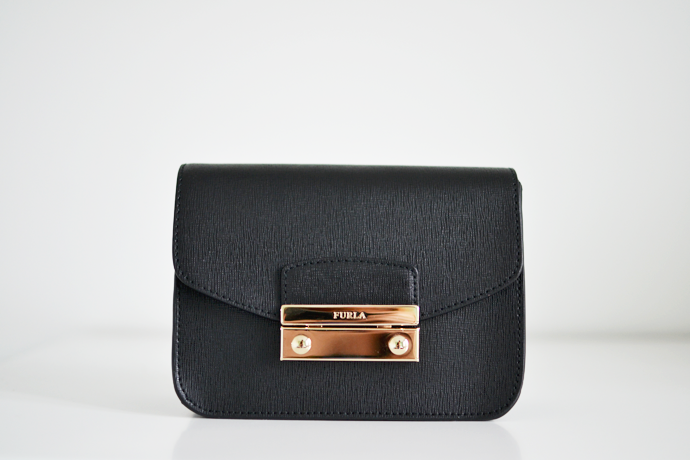 My second choice was the Furla Metropolis. It’s been all over the blogosphere last year and that way it really grew on me. Furla also isn’t easy to come by, but they do have an outlet store in Maasmechelen! Last weekend they had a late opening because the sales started, so in the late afternoon when most people would be gone, we headed over there for our weekly date night. We ate Burgers at Ellis, I got Ice cream and Amorino’s and… I bought a Furla bag. It’s not the Metropolis. It’s not in the pink color I wanted. 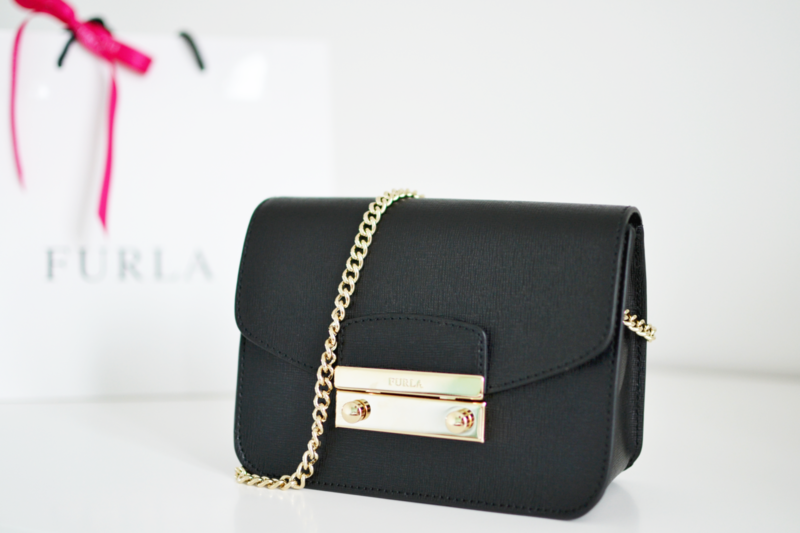 It’s the Furla Julia bag in Onyx (black). And I love it. It came in the saffiano printed leather with a touch of suede on the inside of the flap. The compartment is lined with a satin-like, monogrammed fabric. I was a bit scared that the metal chain would be uncomfortable, but it’s really not. I do admit that so far I’ve only worn it over cardigans. The crossbody strap has that perfect length where the bag hits you right on the hip. It fits my phone, iPod, cards, keys, tissues and a little treat or snack. I’m loving it so much, that I regret not getting the red version either… . Consider that wish listed! 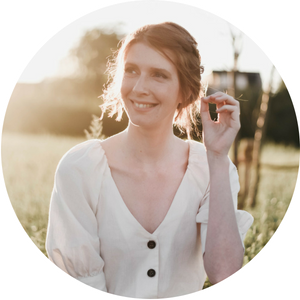 Thanks for the tip on instagram to check your blog too – I like the new layout! Bloglovin isn’t telling me about your new posts which is why I missed this. I actually love the black! It will match pretty much anything you wear is the way I look at it!